Recipe commissioned by Azuñia Tequila; however, all ideas and recipe concepts are our own. Thank you for supporting those brands that make this blog possible. Cinco de Mayo commemorates the historic Battle of Puebla when a small Mexican army defeated the well-financed French army. Please remember, it does not mark Mexico’s independence. Although the holiday is mostly celebrated here in the United States, we think it is a good opportunity to take a deeper look at the city of Puebla’s most iconic dish — Mole Poblano. 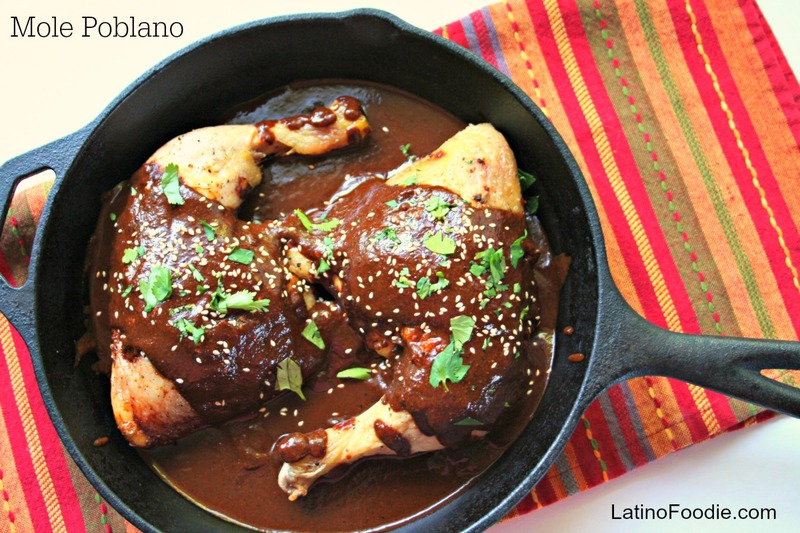 This authentic preparation marries mulato, ancho/pasilla, and guajillo chiles with warm spices, and sweet Mexican chocolate to create a velvety smooth sauce ideal for spooning over chicken or smothering steamed veggies. Generations have labored over a hot fire cooking their mole down to a paste, which can be reconstituted for later use. This recipe yields 10 cups of sauce, which you can use in one sitting or freeze a portion for future use, no pasting required. Unlike making the thicker paste which takes hours, making straight mole sauce takes less time but it’s still important to make the cooking process manageable and enjoyable so have all of your ingredients pre-set and measured. We’ve also broken the process down to a few easy parts: Chiles, Seeds and Spices, Creating the Sauce. Making the mole will feel so easy and seamless you’ll tell everyone that you’ll make it for the next party. As you gather with friends and family to celebrate Cinco de Mayo, everyone will appreciate the love you put into your mole dish. The weather gets hot here in Southern California during the month of May so nothing pairs better with this Mole Poblano than an icy cold margarita made with Azuñia Tequila Reposado. The tequila has a clear sweet agave bouquet and a very refreshing vanilla-minty finish taste. You can choose from their varieties: Blanco, Reposado, Añejo, and Black. Visit Azuñia Tequila website to see the variety of recipes and find the one you like. Azuñia has launched a national campaign to find the most delicious, authentic, and grown-up Cinco de Mayo recipe and we are honored to be one of the 10 food bloggers to be featured. You can help us be named the “Azuñia Food blogger of the Year.” These two hungry bears WANT TO WIN! 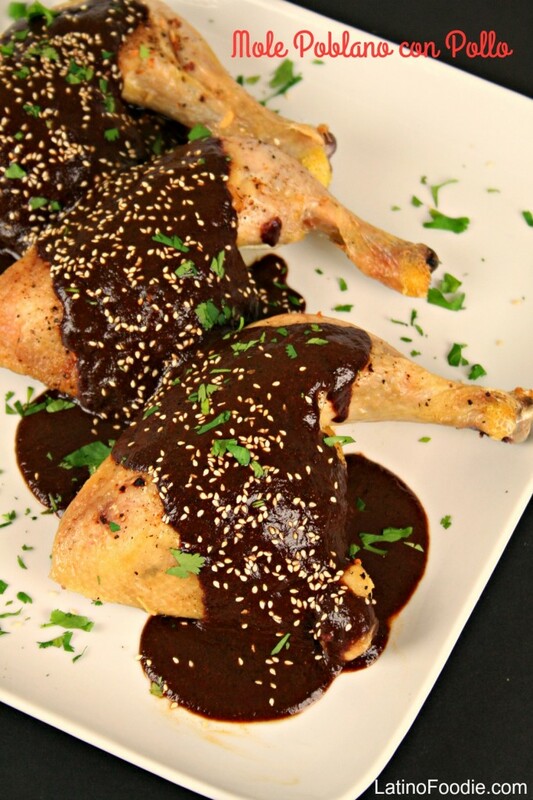 Thank you for helping us by voting for our Mole Poblano recipe between April 18th-29th. You will be entered for a chance to win a Grand Prize of 1 full suite of Azuñia tequila, a home bar tool set, and a home cocktail mixing book. Visit this link here to vote! In a large dutch oven over medium-high heat, add 1/2 cup vegetable oil. Add chiles in 2 or 3 batches and sauté, stirring often, being careful not to let them completely burn. Remove with tongs/slotted spoon and place in a large mixing bowl lined with paper towels to absorb excess oil. In the same oil, add chopped onion and garlic and sauté for 2 to 3 minutes, stirring, until they soften and release their aroma. Stir in the almonds, peanuts, raisins and pumpkin seeds, and let them cook for 2 to 3 minutes. Stir in the sesame seeds, reserved chile seeds, stemmed cloves, anise seeds, coriander seeds, black peppercorns, cinnamon stick, ground allspice, thyme, and oregano. Stir frequently and let it all cook for 3 to 4 more minutes, stirring often. Add the orange zest, tortilla and bread pieces along with the tomatoes and tomatillos. Let it all cook for a couple of minutes until the tomatoes are softened. At this time, add the already sautéed and softened chiles and pour in the chicken broth. Stir and once it comes to a simmer, add the chocolate pieces and the salt. Mix well, and let it simmer for 12 to 15 minutes. Turn off the heat, cover and let the mix rest for at least a half hour to allow the chiles to soften completely. In batches, puree the mixture in the blender or food processor until smooth. Push through a sieve into a large stock pot adding additional chicken broth to get to a thick sauce consistency. Serve over cooked chicken or turkey and sprinkle with toasted sesame seeds. 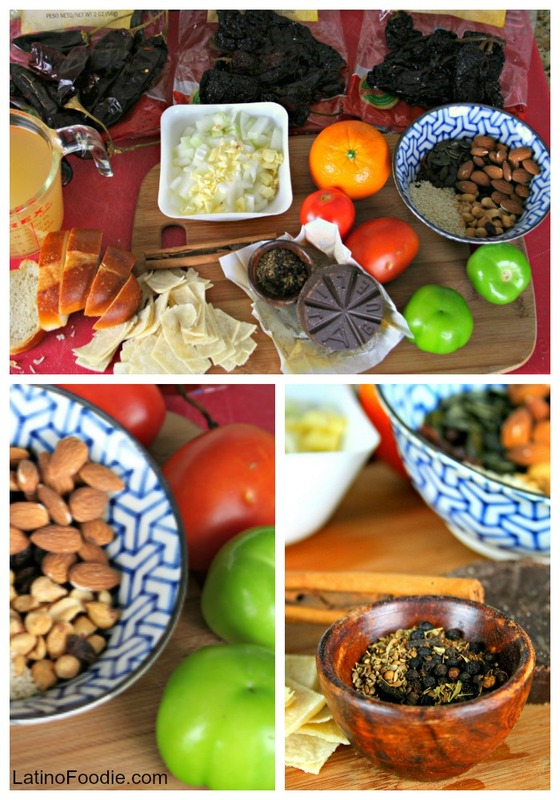 is having a campaign to find the most delicious, authentic, and grown-up Cinco de Mayo recipe. This is a superb presentation of mole poblano. You certainly deserved to win the contest. Congratulations on your excellent work.